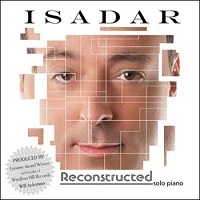 Pianist Isadar traveled to the famed Imaginary Road studios in Windham County, Vermont, and set about "deconstructing" selections from six previous albums. Working with ace producer Will Ackerman, Isadar then delved into the meat of his compositions and found their essence, their heart and soul, and proceeded to "reconstruct" these songs for a new recording (thanked immeasurably by not just Ackerman's production acumen but the engineering and mastering might of Tom Eaton). On the back cover liner notes, Ackerman states "Isadar brought his compositions and his brilliant performance capabilities to my Imaginary Road studios..and simply astounded Tom Eaton and myself with his talents, his focus, and to be honest – his remarkable humanity." Well said, Will. I listened to Reconstructed perhaps eight or ten times before it really hit me. Part of that is probably because I get so many solo piano recordings sent to me. I'd be lying if I didn't tell you that sometimes they all seem to run together to a degree - there are a lot of good pianists out there releasing solo discs, after all. Then, one night, I had Reconstructed on in the background and I started sensing the marrow of what Isadar was doing. During earlier playings, I tended to become preoccupied with his amazing technique - he can balance freneticism and delicacy within a 30 second time span. Near the Edge of Light aptly demonstrates what I'm referring to, as he can go from a nuanced whisper to a thundering herd of notes to a lightly traipsing flurry of soft yet fast tempo melody. Whew! Admittedly, I enjoy Isadar the most when he quiets things down, as this is when I think his "humanity," as Ackerman refers to it, shines through brightest. On the other hand, even when he lets it rip, if one were to play the CD at a softer volume, as I did that mind-opening night, the shifts in tempo/mood/tone seem to coalesce into a whole of sorts. Understand, it takes a certain kind of music to both call attention to itself yet also not prove a forceful distraction (I was doing an intense bit of detailed paperwork at my day job where I had returned after dinner). Make no mistake, while there is plenty of variety here, this thread of identity, for lack of a better way to describe it, binds all sixteen tracks together. I won't go so far as to say this is a meditative recording (far from it at times), but again, at low volume, unless one needs metronomic-like repetition of meter and tone, this could provide a good backing for reading, studying or other activities for which relaxation music would prove too sleep-inducing, perhaps. Singling out tracks for special mention will not be easy, but I want to give you, dear reader, more to go on. Summer Nights is a gentle, rolling, fluid piece that opens the CD, on which Isadar paints a picture of both the bustle of nighttime activity yet also the sensation of winding down, too. Throwing the Dice bristles with dynamic tension, punctuated with brief bursts of drama, as if Isadar is trying to evoke the thrill and risk of the titular gamble. Will it be 7 or 11 or the dreaded snake eyes? End of the Line carries an air of contemplative resignation, not sad but a realization that this is it. On The Purple Heart (a summary), Isadar's piano's notes seem to drop like soft raindrops, something in-between a pattern and complete randomness. I love this piece – it speaks of quiet repose and remembrance. In stark contrast Where the Wild Things Are would be at home played in a down-and-out jazz joint, the clink of cocktail glasses melding with the back-alley cat struttin' riffs from the piano, melding into the rhythms of the night itself. The Bermuda Triangle starts off as one of the warmest, almost nostalgic, pieces here, and then heads into a more active, semi-mysterious mood, then switching back into a louder, more optimistic tone, and then back again…well, you get the picture. The closing track is Voice of God (Thanksgiving)/ and it's (as one might expect) a subtle, sensitive song, with a gentle fluid pace and the kind of melody that lingers after the last note is played. I would imagine that even if one owns the Isadar albums that these compositions were culled from that Reconstructed would be well worth picking up, not just because the songs have been re-worked but because of where they were re-worked and who aided the artist in getting things "just right" there in the Vermont woods. When I first started writing this review in my head (after about five playings), I was going to make a minor critique of the CD's lack of "focus" and cohesion, i.e. the presence of multiple tempos and moods. However, as I wrote above, that didn't prove as much an issue for me under the right circumstances. I will say, though, that I'd love to hear an entire album of soft, quiet music from Isadar, because his control of nuance and subtle shading makes even the most minimal music sound special. For now, I'll certainly content myself with Reconstructed, one of the better solo piano offerings this year.